Joining Reebok's rap-tastic "I Am What I Am," campaign, which we still think they stole from popeye, are Nelly and Daddy Yankee. 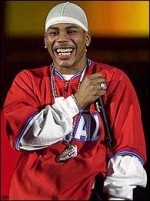 In April, Reebok will introduce a Nelly-inspired line of sneakers, t-shirts and hats. Daddy Yanke will join the party May23 with a line of sneakers. The two will become part of Reebok's $50 million campaign. So hes not performing "Air Force Ones" in concert anymore? This campaign gets weaker with every new artist they sign. I think it will be good and successfull campaing.